Time for the senior session of the US classic! Again, refresh the page every so often to get the latest updates! Quad screen on the YouTube channel. The Olympic Channel isn't broadcasting till six (my time). So watching the live feed on YouTube is suuuuper exciting right now... looks like they're trying to get set-up for the Olympic Channel broadcast. A thought that I've been having, there's a gaggle of new seniors looking to make their mark. It's the first time in four years that "Simone Will Win" isn't a foregone conclusion. We literally don't know what to expect. It's anyone's game. It's the wild, wild west there! Before this gig officially starts - I have some updates. 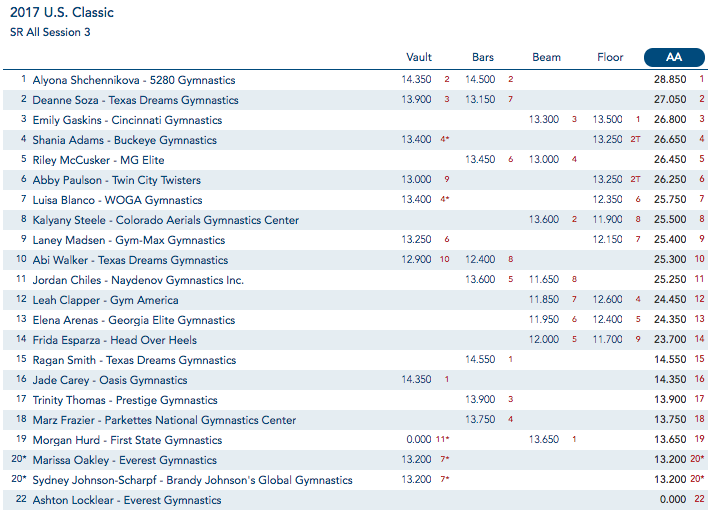 So the Olympic Channel is broadcasting P&G Championships and worlds. The YouTube stream is playing an ad for the American Cup that is literally a fluff piece. Walkouts are beginning on YouTube. Olympic Channel broadcast is finally starting. Oh hey John Roethlisbeger, nice seeing (hearing) you here. 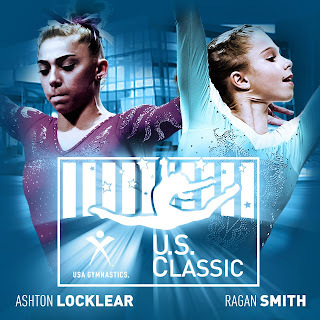 I can see the Lisa Frank store vomit leo peaking out from Ragan's warm-up. Getting a good look at the Texas Dreams leos, and they definitely look like a Lisa Frank creation. You just need the kitschy unicorn and you're golden. 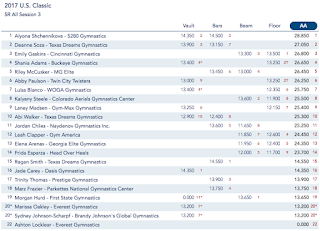 Sunisa Lee UB - nabieva + pak, toe on + maloney, gienger, stalder, pike jaeger, toe full, full in dismount. 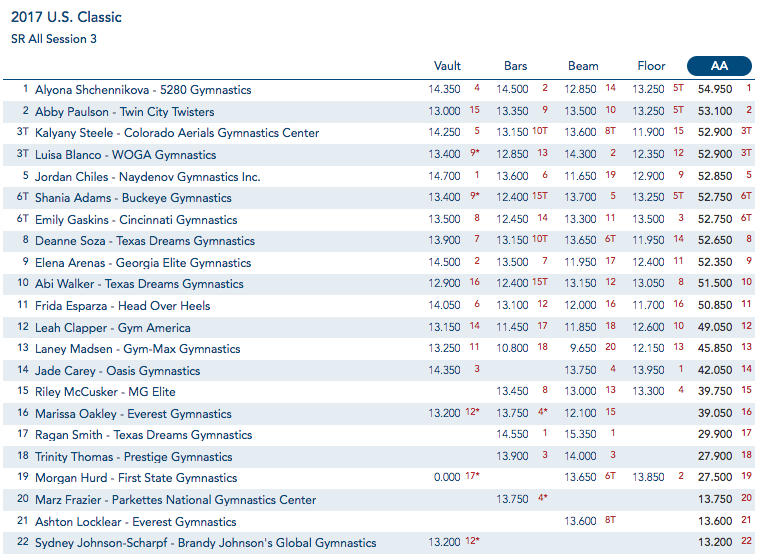 Jade Carey VT - Tsuk 2/1. Love this variety of vaults so far, she's doing an Amanar for her second vault - takes some steps to the side. These girls are beautiful, they all look like models. Marz Frazier UB - stalder full, shap 1/2, pike jaeger, chruch + pak, her hand slipped, but she didn't fall, girl kept going, huge tkachev, DLO, solid. She is gorgeous. Adeline Kenlin BB - interesting mount, sw + sw 1/2, + back pike, aerial + loso, spl 1/4, fro aerial + spl + sissone, BHS + BHS + 2 ft layout, BHS + BHS + double pike, chest a bit forward, but doesn't move her feet. 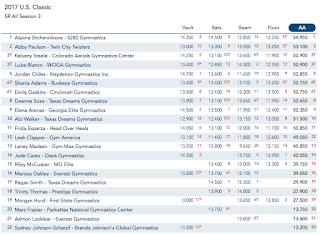 Alyona is still in the lead, as you can see. "as long as we have a strong junior team, we will have a strong senior team" ARE YOU LISTENING ROMANIA? Deanne Soza BB - side split mount, front tuck + straddle jump, BHS + LOSO, perfect knees, toes, side aerial, L turn to illusion, balance check, straddle 3/4, sw + sissone, BHS + BHS + double pike dismount, small step to the side. She is gorgeous. Husband keeps talking to me while this is on. Doesn't he understand that this is more important?! Gabby Perea UB - Cue the Jeopardy theme song while we wait for the judges to get Emily Gaskins' score... in bar 1/1 + maloney, ricna, pak, to shap 1/2, single fly away dismount. Alyona ends with a 54.950 and is the winner. BOOM.